A few weeks ago, we took a look at the work of Seoul-based photographer JeeYoung Lee, who creates personally cathartic dreamscapes in her miniature studio. Today, we're going to take a look at the work of Benjamin Von Wong, which follows similar principles to Lee's work. Von Wong creates exceptionally dramatic and dreamlike images, but all without the use of Photoshop or any other kind of digital manipulation. Instead, he creates truly elaborate scenes, with painstaking attention to detail. 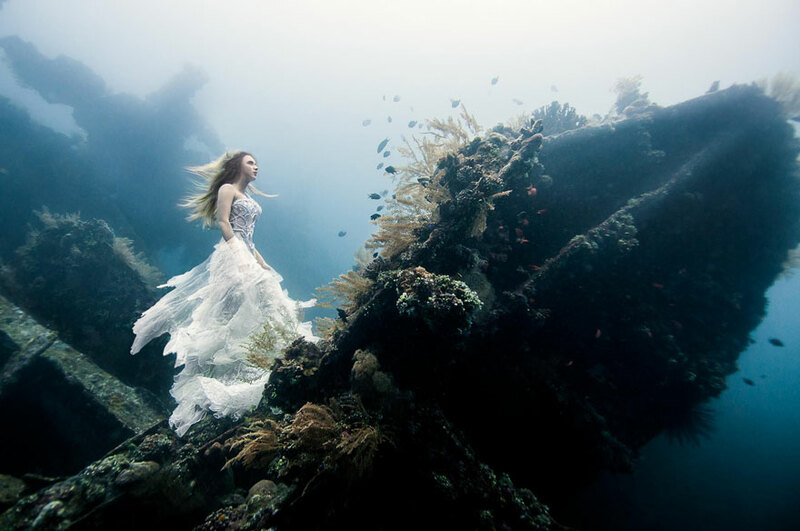 In the example shown above (image credit, naturally, goes to Benjamin Von Wong), one of his most recent photoshoots took place at a long-abandoned shipwreck off the coast of Bali, Indonesia - entirely underwater. It took an enormous crew of divers and models to pull off, and the photographs they produced were absolutely breathtaking. Because the models couldn't be festooned with scuba gear and the shipwreck was in fairly deep water, the solution presented itself in the form of freedivers. Freediving is the apparently exhilarating sport of extreme depth diving without any equipment, making them perfect candidates for models in great shape with the ability to hold their breath for extended periods in shark-infested waters, a remarkably specific set of requirements for a photoshoot. Interestingly, Von Wong originally got his photographic start in Montreal, Canada, but after building a fan base on Facebook and Twitter, he was able to gather some Kickstarter funding to send him on a photographic odyssey throughout Europe. This should help give those of you aspiring to an artistic career the real value of social media, as the fanbase he established there allowed him to quit his day job and devote himself to photography fulltime. He also was very careful in his use of the stories behind his shots, creating hit 'making of' videos that were released on YouTube to widespread interest. Due to the elaborate care that he takes in each and every step of his photoshoots, he was set to capitalize on the interest that art viewers always seem to express in the stories behind the images they enjoy. As he explained to Digital Photography Review when asked how he built his fan-base, he said, "The same way that you come up with fans on any network, you just stay very active. I was shooting a lot. I was putting up almost a photograph a day." Social media can be a powerful tool, but it has to be used in the right way: regularly!